This tutorial will show you how to set up the ExpressVPN Router App on the Netgear R6300v2 and Nighthawk R7000. Important: Before starting, please verify that you have the Netgear R6300v2 or the Nighthawk R7000 and not another model. Some Netgear and Nighthawk models may not support VPN. Be sure to check carefully before proceeding. Begin by downloading the ExpressVPN firmware on your router. 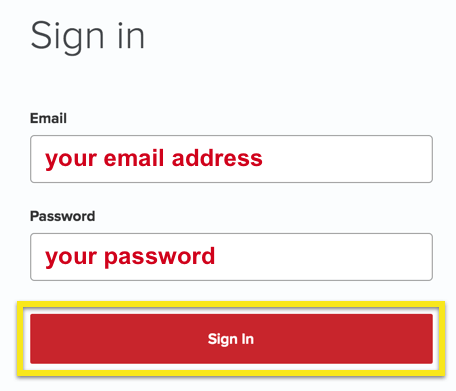 Sign in to your ExpressVPN account using your ExpressVPN email and password. Click on Router on the left side of the screen. On the right, select your router model name, then click Download Firmware. You will also see your activation code listed on the screen. Keep this tab open or paste your code into a word processor, because you will need to refer to it later. Important: ExpressVPN recommends keeping your existing network and adding the ExpressVPN router as a second router. You can do this by connecting an Ethernet cable from your modem to the WAN port of your primary router, then connecting a LAN port on your primary router to the WAN port of the ExpressVPN router. If you would like to only use the ExpressVPN router, you are recommended to first set up the ExpressVPN router as a secondary router and later remove your primary router. Access the Netgear router dashboard by visiting routerlogin.net. If you cannot access the dashboard through the URL, try to find your router’s gateway (e.g., 192.168.1.1). You can follow the instructions here. If you have the option, skip changing WiFi name (SSID) and password, as well as admin credentials. This is because the information will be reset to default when you flash the ExpressVPN app onto the router. Open a browser and access the Netgear router dashboard by visiting routerlogin.net. If you cannot access the dashboard through the URL, try to find your router’s gateway (e.g., 192.168.1.1). You can follow the instructions here. You will be prompted to log in. Enter your existing router username and password. (The default login/password is admin/admin). On your router dashboard, click on the ADVANCED tab. 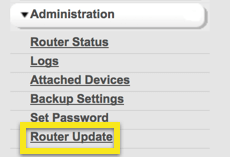 On the sidebar, select Administration, and then Router Update. Click Upload to reflash the router with ExpressVPN firmware. You may need to restart the router. After restarting, you will need to ensure you are connected to your Netgear router. If you are connected via cable (recommended), then you are already connected to the Netgear. If you are connected via Wi-Fi, you need to find the NETGEAR_(modelname)_(revision) Wi-Fi network and connect to it. The password can be found on the sticker at the front of the router. Go to expressvpnrouter.com, and enter the default login and password, admin and admin. Enter your ExpressVPN activation code and click Activate. You will be connected to the VPN. If you were previously not connected to the internet, you will need to plug in an Ethernet cable now. 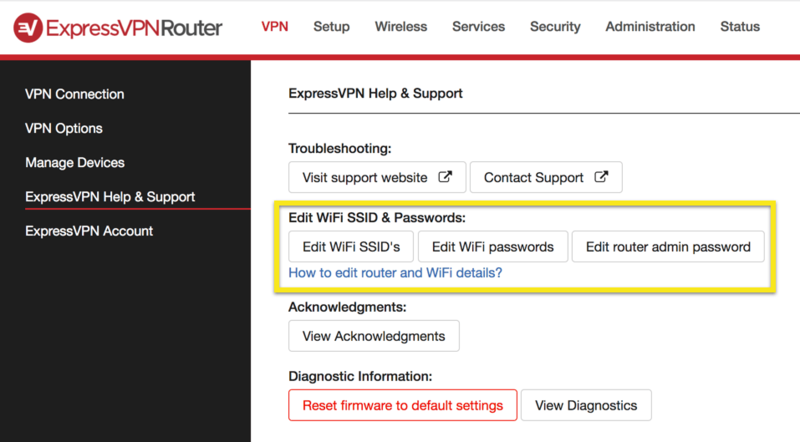 On the VPN tab of the ExpressVPN router dashboard, go to ExpressVPN Help & Support and click the buttons to reset WiFi name (SSID), WiFi password, and router dashboard credentials. On the VPN tab of the ExpressVPN router dashboard, go to VPN Options. 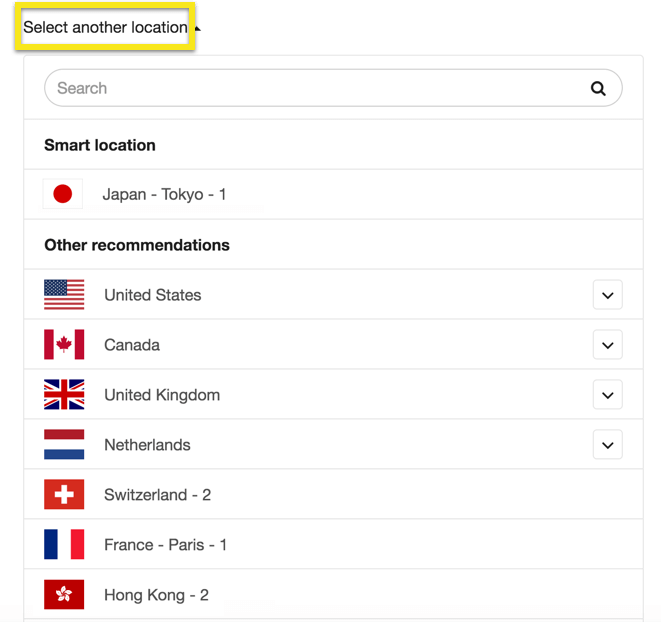 Scroll to Recently connected devices and select which devices you wish to have protected by VPN or not protected by VPN.